Netflix is testing price rises for UK customers | What Hi-Fi? Netflix is testing new prices for the UK market. Viewers around the UK have reported seeing different prices for each bracket, with some as high as £12.99 a month. Netflix's Premium package usually costs £9.99 a month, but it appears as though the streaming service is trialling charging £10.99, £11.99 and £12.99. The Premium package gives you content in Ultra HD, and lets you watch on up to four screens simultaneously. The Basic and Standard packages have also been spotted with higher prices attached. All of the price rises would only apply to new customers. It appears as though these new price variations are part of a test that will help determine if – and by how much – the streaming service will increase its UK prices. Netflix stressed that this is no guarantee its service will cost more in the UK. 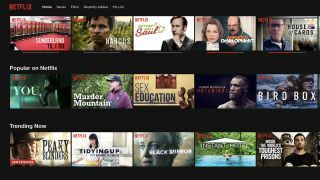 "We are testing slightly different prices to better understand how members value Netflix," a spokesperson told Digital Spy. "Not everyone will see this test and we may never roll out these specific prices beyond this test." They added: "Our goal is to ensure that Netflix is always great value for money." Netflix raised its US prices in January. This isn't the first time Netflix has spooked its customers with a test. The streaming giant has previously tested advert breaks in its original content, pre-roll videos and screensavers, all to mixed reactions from customers.